We are back to celebrate little transformers: insects that are more than meets the eye. In this post I feature an insect whose transformation may seem a little awkward at first. It is not of cryptic nature, and it is not a case of mimicry. While doing research about whip spiders in Belize, I also surveyed the insect biodiversity of one site, and so made sure to visit the light traps that we set up in several spots. The traps attracted an impressive diversity of insects, including moths, leafhoppers, ants, mantids, and katydids. One night a beautiful longhorn beetle (family Cerambycidae) showed up at the light trap. I did not recognize it at first so I collected it for a short Meet Your Neighbours session. It was Eburia pedestris, a member in a genus of hardwood-boring longhorn beetles with a wide distribution in the Americas. I took a few decent shots. The beetle was trying to escape of course, so I reached out to grab it before it fell from the acrylic sheet. The moment I touched it something interesting happened. It crossed its legs and took a sitting position. I could not help it and I sneaked a loud laugh, because it looked like the beetle was in the middle of a yoga practice. It stayed in this comical position for a while, so I took some additional shots. The strange position did not make a lot of sense to me, but I thought maybe it was a more elaborate way of playing dead, a common behavior in many beetle families (which will probably be featured more than once in this series). I finally decided not to wait for the cerambycid to “open up” so I grabbed it in my hand to put it back into the vial before releasing it outside. And then it hit me. I mean, it literally hit me. I felt my hand being pierced in several spots. Blood was dripping from my fingers. You see, there is a reason why Eburia beetles take this unusual body posture. Look at the beetle’s leg joints and at the tips of the elytra. By taking a “sitting” pose, the beetle transforms into a prickly business, pointing sharp spikes in all directions, making it difficult for large predators like myself to handle the beetle. It will also not hesitate to use its other cold weapon: biting mandibles. Something I only noticed much later when I examined the photos – notice how the beetle contracts its abdomen, to make the elytral spines more prominent. Even with caution it was difficult not to get your skin punctured by the spines. They are as sharp as syringes. I would not want to imagine the experience for a mammal trying to eat this beetle. Ouch. Longhorn beetle (Eburia pedestris) in defense posture. Grab it if you can. Some insects prove to us that avoiding predators is not all about hiding, mimicking other organisms, and advertising toxicity or potent venom. There are other, more creative ways to survive in the jungle out there. I will even take it a step further and say this Eburia beetle is comparable to the armadillo girdled lizard in its behavior. Nature is so awesome. If you missed my subliminal message in the last two sentences of the previous post, I am not done yet with the Transformers. I was building up to this exact moment. You see, insecticons ARE everywhere. Maybe not in the same context as depicted on the TV series, but still there are creatures out there that are more than meets the eye. A substantial part of their existence relies on fooling predators into thinking they are something else: an inanimate object, another animal, or something completely different. I am happy to introduce “Little Transformers”, a new section on the blog, in which I will present interesting cases of insects in disguise. We are launching this series with the beetle that started it all – the pill scarab (member of subfamily Ceratocanthinae). If you run an internet search with the words “transformer” and “insect”, there is a high chance that one of the results will be an image created by Kenji Nishida, showing a small beetle from Costa Rica transforming from a ball-mode to beetle-mode. The image has gone viral soon after being posted online, and now that Ceratocanthus beetle is fairly recognized by title as the beetle transformer. I have posted an image of a similar beetle before on this blog, a Ceratocanthus species I found in Belize. It was featured in an excellent phylogenetic paper about this subfamily by Alberto Ballerio and Vasily Grebennikov, and even made it to the journal’s cover. I recommend checking the paper out, even if you are not interested in these beetles, you can enjoy the beautiful images showing the impressive diversity of the group. Ceratocanthinae are a subfamily of Hybosoridae within the Scarabaeoidea beetle group, containing over 360 described species, most of which are small in size (just a few millimeters in length). They have a wide distribution range mainly in tropical regions throughout the world, with only a few genera and species recorded close to temperate regions. Ceratocanthinae also occupy different types of habitats. The highest diversity seems to be in new world rainforests, but they also occur in temperate forests, subtropical forests, savannahs, and even in coastal deserts. Adult Ceratocanthinae are best known for their ability to conglobate: rolling into a nearly perfect ball. The elytra, pronotum, head, and all six tibiae interlock with each other by means of grooves and corresponding ridges, forming a tightly connected external surface. Many beetles take the form of a tight compact structure when threatened, however in Ceratocanthinae the tibiae of all six legs participate in forming the external hard surface of the sphere, unlike in other beetles. It is fascinating to observe these beetles transform to and from their alternative mode. Nancy Miorelli, an entomologist and science communicator living in the Maquipucuna reserve in Ecuador, recently recorded a video showing the beetle opening up (by the way, Nancy also creates beautiful jewelry from insect wings and Tagua nut with the proceedings supporting rainforest conservation and the local community. You can check out her shop here). Why do they do this? The ability to roll into a tight compact structure probably has anti-predatory and physiological advantages, such as moisture retention or thermoregulation. It seems that the primary use is as a form of crypsis, to avoid detection by nearby predators, however after following several beetles in the wild I noticed that they stay transformed into the ball-mode even when they are not active; perhaps it is a way for them to rest too. Pill scarab beetle (Ceratocanthus sp.) from southern Belize. Full beetle-mode! Unfortunately, very little is known about the biology of Ceratocanthinae. They are sometimes found under bark, in tree holes, and in decomposing wood. Several records report adults and larvae that have been found in termite nests. However, It is unclear whether Ceratocanthinae are termitophilous and have a relationship with the termite hosts. The ability to roll into a ball can serve as a defense and might be an adaptation for living in the hostile environment of a termite nest. Another suggestion defines the beetles as termitariophilous, in other words attracted to the properties of the termite nest itself as opposed to its inhabitants. While the feeding habits of Ceratocanthinae are mostly unknown, a handful of observations report adults feeding on various fungi. It is therefore possible that Ceratocanthinae are attracted to some of the fungi growing on the surface of termite nests. This can explain the presence of the beetles in the nests, but unfortunately without additional data about the beetles’ life history it would be difficult to validate this connection. So the next time you are out in the field and you stumble upon a tiny sphere in a peculiar place, take a closer look. If it looks like a beetle mummy, then bingo! You have a Little Transformer. Now all you need to do is wait for it to open up… Patience. Lots of patience. This is the story about how a small blattodean taught me something I did not know about beetles. While photographing frogs in the Ecuadorian Amazon this past October, I noticed a tiny insect running across the surface of a fallen leaf resting on the forest floor. It had bright colors and looked interesting, so I collected it in hopes to photograph it later. When I finally got to do it, I was struck by its deception. You see, when I initially spotted it I thought it was a beetle. The dome-shaped body and the bright coloration resembled those of some leaf beetle species (family Chrysomelidae), and this insect even moved and walked like a beetle. Nevertheless, a close inspection revealed that its whole body was segmented. This was no beetle. It was a blattodean nymph. Beetle-mimicking cockroach nymph. What could be the model species? Blattodeans exhibit some beautiful examples for mimicry, with some species resembling poisonous fireflies and venomous assassin bugs. It should come as no surprise that a blattodean might benefit from looking like a leaf beetle. While many leaf beetles are harmless, some species harbor chemical compounds that make them poisonous or distasteful to predators. Unfortunately, identifying a blattodean from its larval stage is very tricky and close to impossible. I was not able to locate anything that looked like the adult stage of this species. However, when I examined this cute blattodean I remembered that I have seen this color scheme on a leaf beetle before, and after digging in my old photo archive I was able to find the record. Leaf beetle. Or is it? I took this photo on one of my first visits to Ecuador, over a decade ago. I did not plan to do anything with the photo, but I thought it was a nice-looking leaf beetle and so I snapped a quick photo for my own records. Only I was completely off. This is not a leaf beetle. Unlike most of its family members that are elongated and dull-colored, Nilio is a genus of darkling beetles (family Tenebrionidae) that bear a striking resemblance to leaf beetles and ladybugs. This resemblance can fool even experienced entomologists. Darkling beetles are well-known for their chemical defense, secreting odorous chemicals that will deter even the most enthusiastic field entomologist. This can explain the blattodean mimicry shown above. After I realized these photos show a species of Nilio, I checked the rest of my photos from the very same trip, and started finding more photos of Nilio species. Here is a group of larvae on a branch. Nilio larvae are gregarious (live in groups) and feed on epiphytic lichens. If you have ever seen the typical wire-worm larvae of darkling beetles you will understand why I labeled this photo as “chrysomelid larvae” in my archive. In some species, not only the larvae, but also the adults, are gregarious. Here is a group of adults I found on a tree trunk close to their pupation spot. Like the larvae, these adults were feeding on lichens as well. As you can see, not all Nilio species have bright coloration as the species shown above. However, even when they are closer to their “darkling roots” they still look more like to members of Chrysomelidae than Tenebrionidae. This all goes to show that even when you are confident about your knowledge of insect taxonomy or biodiversity, nature can still surprise you. I embrace these moments when I am caught unprepared; nothing like learning something new! Last week I met with Catherine Scott and Sean McCann, two talented naturalists and spider-enthusiasts (Catherine studies the mating behavior of black widows, and if you haven’t already, I recommend following her live tweets from experiments). It was great to go hiking together in the snow-covered woods, looking for arthropods hidden inside fallen logs. Before we went on the hike, they brought me a few entomological presents, one of them were lovely beetles that they found during a trip a week earlier. These magnificent beetles are Neomida bicornis, a species of fungus-feeding darkling beetles (family Tenebrionidae). They are tiny, measuring only a couple of millimeters in length. To the untrained eye they do not even look like darkling beetles, these beetles are like jewels! Their body is very shiny, metallic green in color. The elytra have a bluish tint. Populations of Neomida bicornis in southern North America have an orange pronotum (a true feast of colors, for a darkling beetle at least). The males are characterized by four horns, two of which prominent between the eyes, and two smaller ones on the clypeus (=lip area) above the mouth. The females have no horns. I admit, I have a soft spot for horned insects. What a fabulous gift, thanks again you guys! These beetle are tiny! That’s the tip of a regular ruler with a millimeters scale. This species is not rare, but its way of life makes it hard to find: the adults and larvae feed on bracket fungi (polypores) and burrow into this tough substrate, creating inner galleries. According to Sean, these beetles were active inside the mushroom despite the somewhat low ambient temperatures. From what I learned about eastern North American fungus-feeding tenebrionids, they have overlapping generations. 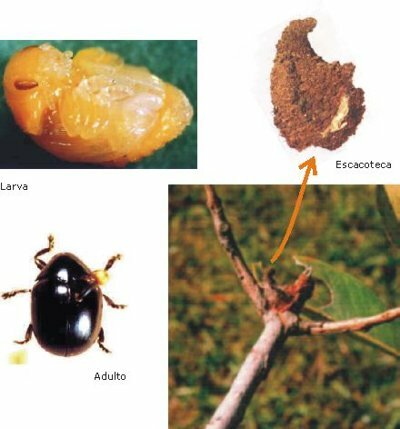 In other words, both adult beetles and their larvae can overwinter inside the mushrooms. I will probably try to confirm this at some point but first I need to find out how the larvae look like. They are not the only arthropods taking advantage of a polypore-type shelter from the cold weather. I was very positively surprised by the response to my previous blogpost about Epomis. In fact, it now seems that this post is the most popular one on the blog, even more than the ones about the botfly and my NZ accident. How do I top it? Only time will tell. In the meantime, I wanted to mention some of the other ground beetles (family Carabidae) that share the habitat with Epomis. You see, when you start flipping stones and pieces of wood scattered around rain-pools you encounter many carabids. But one group really stands out in appearance, and, as much as it is hard to believe, in sound: the bombardier beetles. Bombardier beetles is a large group comprised of several Carabidae tribes. Here I refer mainly to species of the genus Brachinus. These are small to medium sized beetles, usually with striking aposematic coloration: the body and limbs are bright orange, while the elytra (wing covers) are usually dark green or brown, sometimes with a metallic sheen. These colors serve as a reminder for potential enemies that these beetles can deploy a powerful weapon: an explosion of hot chemicals, which can be aimed at almost any direction. Much has been written about the mechanics and evolution of the beetles’ chemical defense. In short, when provoked the beetle releases two chemicals, hydroquinone and hydrogen peroxide, into a chamber in its abdomen. This mixture, when comes in contact with a catalyst, turns highly combustible due to the oxidation of hydroquinone and the breakdown of hydrogen peroxide to oxygen and water. The chemical reaction starts inside the chamber with temperatures reaching 100°C, and the high-pressure buildup causes the explosion. Then all the beetle has to do is to aim its “nozzle” and fire! The result is a smoke cloud of chemicals at extremely high temperatures. It can momentarily paralyze or even kill arthropod enemies, such as ants and spiders. To us humans (=entomologists who collect the beetles with bare hands) the damage it causes is not so severe, usually nothing but a small stain of burnt tissue, but the effect is coupled with a startling popping sound, and that might be enough for the beetle to escape from a large predator. This complex defense mechanism was used by creationists as an example for intelligent design in debates against evolution. However, it can be easily demonstrated that by gradually increasing the concentration of hydrogen peroxide this defense could evolve in incremental steps without risking the beetles’ existence. If you are still confused, I highly recommend watching Richard Dawkins explaining it here. Damage to skin caused by bombardier beetle’s (Brachinus berytensis) chemical defense. Not much. Bombardier beetle (Brachinus bayardi), Central Coastal Plain, Israel. These beetles are strictly nocturnal, and can be found running on muddy banks of rain-pools in search of prey. While the chemical defense of the bombardier beetle alone is interesting enough, there is another aspect in their life history that is fascinating. In most species, the adult bombardier beetles are predators of small, soft-bodied invertebrates, but as larvae they feed solely on pupae of other beetles found in the same humid habitat, usually diving beetles (family Dytiscidae) and water scavenger beetles (family Hydrophilidae). This makes them parasitoid insects – their larvae are completely dependent on another insect for completion of their development, usually with fatal consequences to the host. While most parasitoid insects are wasps and flies, in beetles this way of life is relatively uncommon, with only a handful of beetle families exhibiting a parasitoid life history. Despite searching for years, I have yet to find larvae of bombardier beetles, and my attempts to obtain larvae from captive adults has failed so far. I hope this will change one day.